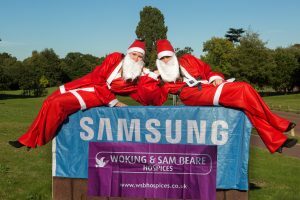 Families, friends and work colleagues are preparing themselves for the annual Santa Fun Run to raise money for Woking & Sam Beare Hospices. Entrants are being encouraged to unleash their inner reindeer in order to run, jog or stroll the 5km or 2.5km route around the Brooklands area. All participants aged four and over will receive a free Santa suit and medal, with Santa hats for children aged three and under. There will also be a prize for the best fancy dress. Chertsey-based Samsung Electronics UK hosted the launch of the event at their headquarters. The hospices’ events fundraising manager, Danielle Le Cuirot, said: “It was such fun to see so many employees taking part in the photo shoot. We can’t wait to meet and greet them on the event day when they all turn up to run! The run is taking place on Sunday 11 December at Mercedes Benz World, starting at 10am. Registration is now open and will close on Sunday 4 December. Registration fees, which will help to cover the cost of running the event, are £12 for those aged 16 and over, £6 for children and teenagers aged four to 15. Children aged three and under enter free. Family tickets are available. A fundraising pack, with handy hints and tips, will be sent to all participants. To register or for more information, visit www.wsbhospices.co.uk/santa or call 01483 881752.